Even with local clinics and hospitals advertising the need for flu shots annually, not even half of the adult population in the United States have gone to get it in the past few years. Clearly, those advertisements aren’t working all that well and people aren’t thoroughly convinced that they need an annual flu vaccine. There are hundreds of thousands of Americans who are admitted into the hospital every year as a result of seasonal influenza virus infections. There are even people who pass away as a result of such infections. This illness should not be underestimated. It may seem like something inconvenient rather than harmless, but I assure you that it can be more serious than you think. If you have a history of asthma, diabetes, heart conditions, HIV, AIDS, or cancer, you are particularly susceptible to the flu. So are pregnant women and elderly people who are more than 65 years of age. 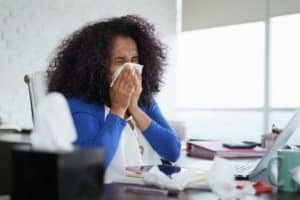 The Centers for Disease Control and Prevention (CDC) say that the most effective way to keep you from coming down with flu-related illnesses and ending up in the hospital is by getting a flu vaccine. How effective the vaccine is may change from year to year, as different flu strains may not be as protected against depending on what is going around that year. However, a flu vaccine is still your best bet against coming down with a flu-related illness. During the past two years, the CDC recommended injectable influenza vaccines and discouraged use of nasal sprays. This means that as of now, inactivated influenza vaccines and recombinant influenza vaccines are more needed than live attenuated influenza vaccines. Both trivalent and quadrivalent flu vaccines remain available to the public. There’s a reason why you are recommended to get a flu shot every year. Your immune response reduces over time and will not protect you after a while, so it’s important for your body to get a refresher. Additionally, flu vaccine formulas are always being modified based on what virus is going around that year so much like you would update your computer antivirus for the most recent protection, you must update your body with the most recent flu protection. The majority of health plans cover flu vaccines thanks to the Affordable Care Act mandating for them to cover preventive care. Do check the terms of your plan – some require that you get yours by a health care provider that is a part of the company’s network. There are quite a few types of flu vaccines available for you to get every year. The most important thing, however, is that you commit to getting one. Don’t assume that you’ll never come down with the flu. It’s better to be safe than sorry. The Florida Wellness Medical Group is based in Tampa, Florida – need your flu shot this Fall? Come on down to see how we can help.